We live in a world where in attacks and thefts have become very common. Everyone is concern with safety for their home, wealth, bank account and their family and so on. There are various ways people take of their home security. The zigbee technology has become one of the top promising one for providing home security products. The reason for the popularity is the lower cost of zigbee products and faster activation. Zigbee is a low power and short distance wireless technology working as per mesh topology. Zigbee devices are activated in about 15ms compare to their Bluetooth counterpart which is about 3sec. Zigbee delivers data rate of 20kbps, 40 kbps or 250kbps based on frequency band chosen. As shown in the figure, Zigbee home security system will have basic wireless devices installed in the home. All these devices are interfaced with wireless router. This router is connected with internet through internet service provider'device. As and when something abnormal happens the same will be communicated to the mobile or tablet of the house owner as registered. Basic components required to form zigbee smart home are wireless motion sensor, smoke detector and window panels/door magnetic sensor. 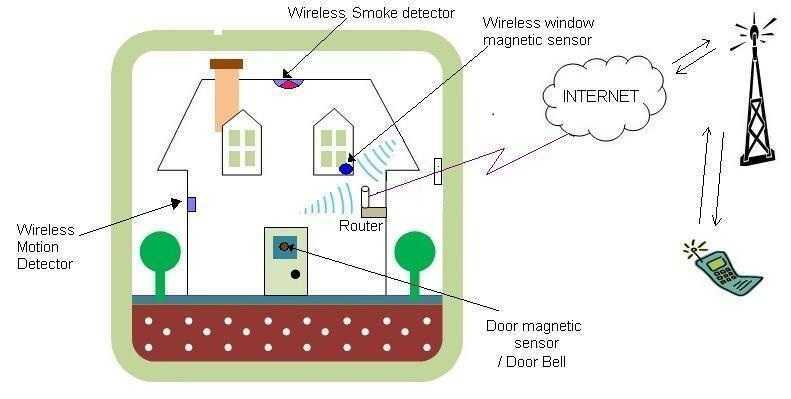 The other Zigbee products for home security available are solar powered wireless fence, wireless temperature and humidity sensor, air quality sensor, sound and light alarm, door bell, wireless flammable gas detector, wireless soil humidity sensor, wireless dimmer switch etc. All these security based home products are manufactured and supplied by Wulian. The zigbee devices and their protocol stack with framework have been designed and developed by manufacturer with security in to consideration. As we know security will be effective when it is implemented efficiently. There are various types of attacks on zigbee network. Most of the zigbee radio devices will have encryption key loaded into the RAM when the device is powered on. Since these keys are written on all the devices constituting the zigBee network, the probability of key change will be very less. Most of the attackers utilize the zigbee serial interface to capture the key and enter into the zigbee network. The zigbee home security system need to have basic precautions to be considered before the same will be used by home owners.